The Span Style commercial square outdoor table is perfect for social eating areas. 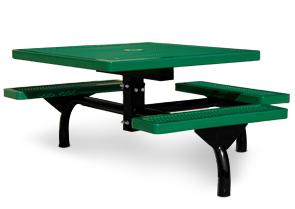 The 46" square (3 Seat ADA - 46" x 57", 2 Seat ADA - 46" x 68") design makes it easy to interact with everyone at the outdoor table, and the 3/4" # 9 expanded metal with round corners top and seats allow for long lasting comfort and usability. 2-7/8" O.D. powder-coated frames add strength and durability to this attractive yet functional table. Available in In-ground and Surface Mounts, all models can be ordered with optional cast aluminum grout covers to give this outdoor table a finished look. Table top and seats are coated with a lightly textured matte Polyethylene finish. 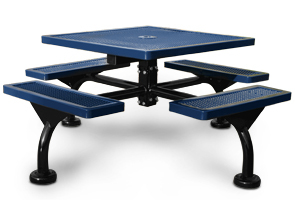 All wheelchair access commercial square outdoor tables conform to latest ADA specifications. Optional 7-1/2" and 8-1/2" umbrellas are available in any of the color options shown above, in either a single solid color or a 2-color alternating pattern. For extra stability and safety, a plastic/concrete Umbrella Stand can also be ordered.